I came up with this pattern totally out of curiosity. I’ve done so much with the “SC+DC in next, SK next” combo (like here, here and here), and one night I was sitting on the couch with a partial skein of Hobby Lobby’s “I Love This Yarn – Sport” and a G hook, trying to make up some boot cuffs with the same stitch and an added ribbed band, but it just wasn’t working. The double crochet stitch was making the rows too tall for the single crochet banding, and the fabric was getting warped instead of laying flat. So, wondering what it would look like if I exchanged the SC+DC for SC+HDC, I frogged what I had and gave it a try. I love those stitches that look like one thing while you’re making them, and then quite a few rows in when you look at everything together, they look different. Case in point: the SC+HDC combo looked pretty similar to the SC+DC combo as I was making it, but after I had a few inches of fabric done, I noticed that as a whole, it looked like a nice, neat pattern of little textured squares. I thought it was really beautiful against the contrast of the ribbed band, too. So, I went with it — and created a brand new cowl pattern! This cowl could be pretty easily created with worsted weight yarn as well — you would just want to adjust your stitch counts to match the cowl’s intended measurements (listed in the pattern). But I just love the look and feel of the #3 lightweight yarn. It has this beautiful drape that makes wearing it totally effortless. Anything that is “throw it on and go” is a winner in my book. Click here to purchase an inexpensive ad-free PDF version! Cowl measures 30" around and is 12" tall. (2) It is crocheted as a flat piece, then seamed at the end. (3) CH1 at the beginning of rounds does not count as a stitch. (4) The phrase "(SK next ST, SC+HDC in next ST) 21 times" means 21 times total. Fasten off, leaving a 36" tail. Use your yarn needle and finishing tail to seam both ends of the cowl together. Fasten off and weave in all ends. This is gorgeous! You are so creative. I love your patternd! Thanks for sharing this pattern with us!!! The instructions look easy to follow and I can’t wait to try it? Thank you so much for your patterns. I love to create for myself and for my family and I can’t afford to buy and finding awesome free patterns like these helps so once again I thank you!!!!! It isn’t made separate. The SCs in BLO create the ribbing section. Thanks so much for the clarification. It makes much more sense to me now! Thanks for the pattern…..bet it would be nice as fingerless gloves too so now I know what I’ll be making next,….& this time, for myself! Thank you. I can’t wait to try it. If you were going to make this for a 6 yr old girl how would you change it. I am still trying to figure out how to adjust pattern to make for the littles in my life without having measurements to go off of. Mistie, I am currently working on this scarf. My suggestion to make it smaller is to start with a smaller amount of chains. The starting chains are going to make the height of the scarf. Then you can just do as many rows as needed to get the width around the neck that you want for a child, so it would take a lot less rows. The back loops are creating the ribbing so you might also want to do a couple less of those at the beginning and ending of each row so that the ribbing is a bit smaller. I hope this helps and Rebecca might have other suggestions. 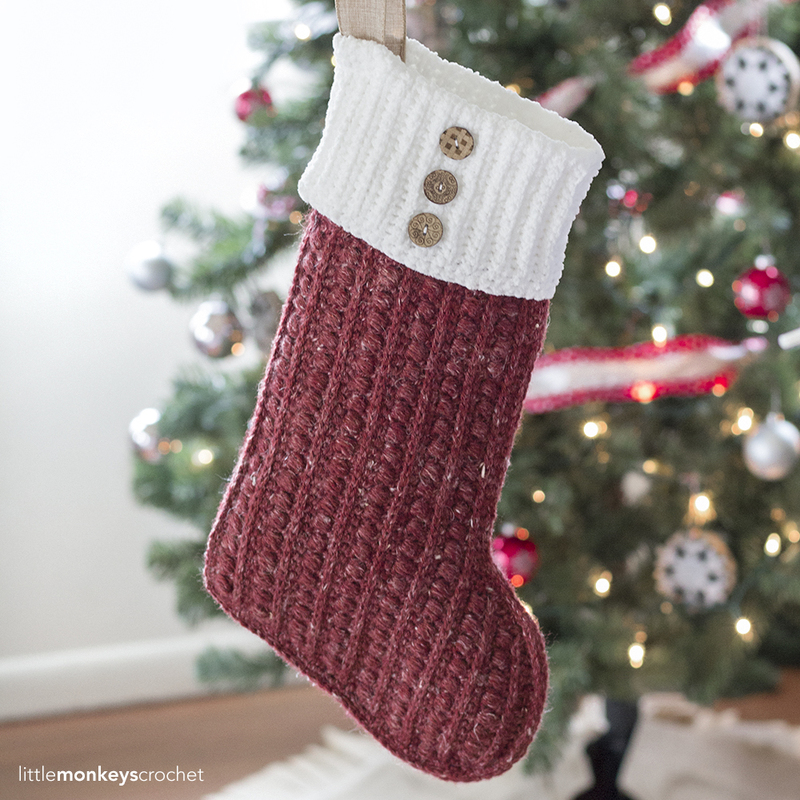 This pattern looks great and easy! I love this stitch combination. I didn’t make the cowl, but it made an awesome edging on a shawl I just completed. I love your patterns, but wish you were here to help me with them. I am a beginner, and have only made afghan patterns in the past. I love this cowl! I made one for a Christmas gift this year and will now be making one for myself! Soooo comfy and cozy…can’t help but snuggle with it. Thanks for the pattern! Thank you for your beautiful patterns! I love this cowl!! I’m planning on making this as soon as I finish making blanket for our soon to be new grandbaby! !!!! I love the way the Comfy Squares Cowl worked up! It is very soft and comfortable to wear! I have some beautiful yarn in my stash … (schachenmayr lumio color) … and neede a simple textured pattern to show it off …. this looks perfect ! I have some beautiful yarn in my stash … (schachenmayr lumio color) … and need a simple textured pattern to show it off …. this looks perfect ! I really love the texture of this .so simple but yet so pretty.thank you for posting it. 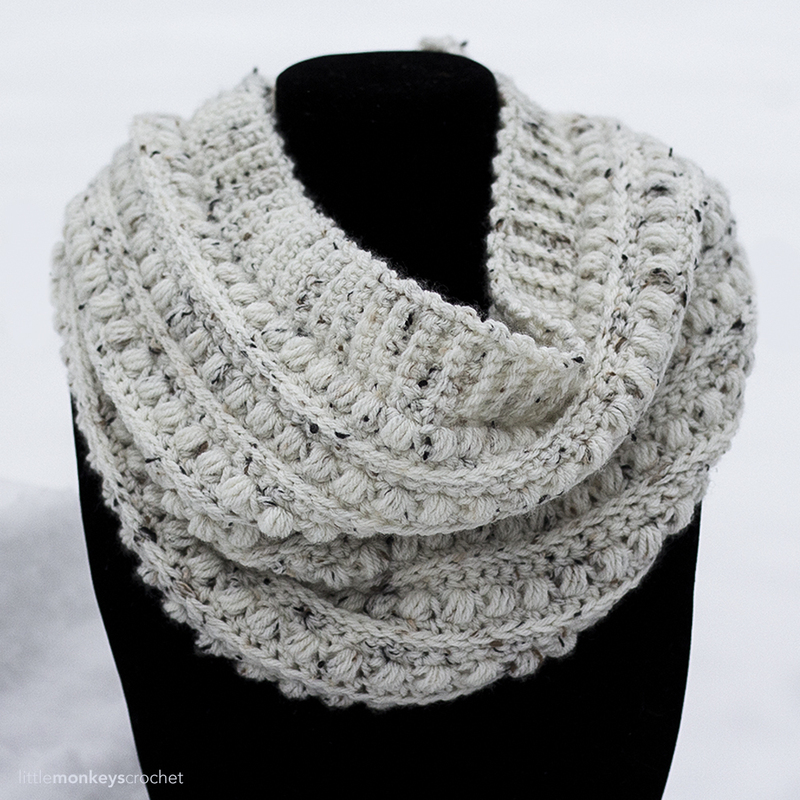 The texture of this cowl is amazing and it looks so soft and squishy! Looking forward to making this pattern. I made this cowl and it was a big hit with my fellow grandmothers at church. This is one of my favorite crochet stitches! 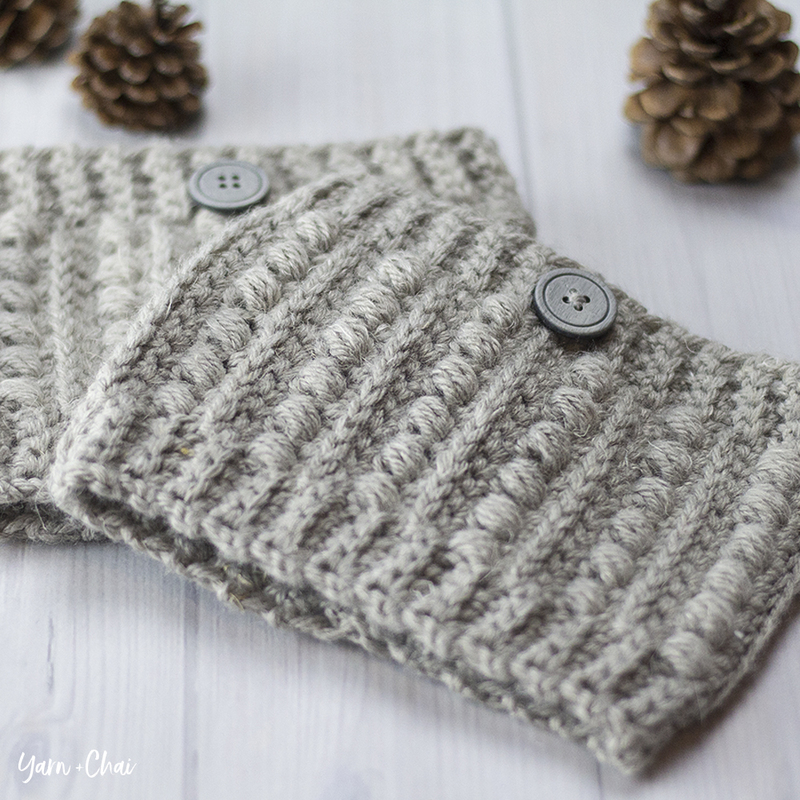 Such a cute cowl! I can’t wait to make this one! Love the texture on this one ! Love this cowl! Would like to make with worsted weight yarn because that’s what I have in my stash. Can you suggest a modification to the beginning chain? Thank you so much for sharing your expertise with us. I do so treasure lovely free patterns. I plan to make a winter cot blanket for my second grandchild with this lovely stitch. Again thank you. Brenda. JOHANNESBURG SOUTH AFRICA. New to site, just saw the textured cowl. Liked the combinations of stitches, like the slot+sc. However, did you make the ribbed band before or after? Nice work, I am excited to Try it. Hello, you’ll see in the pattern that it is worked in vertical rows so the band is worked right along with the rest of the pattern (not before or after). I’m working on this pattern right now. You have a great site. Your patterns are beautiful. I look forward to yoit next posting. I love this pattern. Thank you for creating and sharing it. You make such beautiful pieces. What if I waneed to make this a blanket? How would I go about making it larger? Love your patterns . 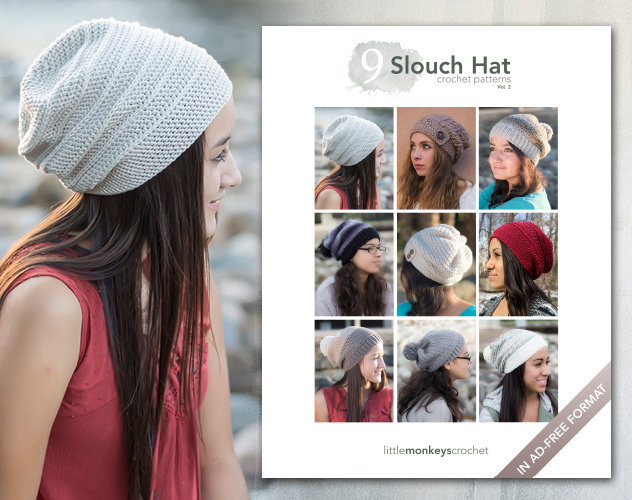 I would like to make the Marion Slouch hat using the Lion Brand’s LB Collection 100% Superwash Merino Wool. I would really like to make the double infinity wrap to match the hat or the textured Cowl I am wondering if there is a comparable yarn that I can use for both? I am new to crocheting and can not quit get the knack of picking out the correct yarns?. I know I diffently want to make the hat but am looking for a yarn that I don’t have to order online and can make a matching cowl and maybe boot wraps. Any suggestions? If you’re only concerned about the finished look, I think you would be fine to use the yarns recommended in each of those patterns. They will feel a bit different (not as soft) but will work up with about the same stitch definition. I hope that helps! Hi Rebecca! Love this neck ring! It puts me in mind of a very lovely one that I bought in a yarn shop in Silver City, New Mexico. I bought it because it was very colorful and I loved the pattern … it was knitted and I don’t knit. If I sent it to you to check out would you be interested in seeing it and taking on the challenge of creating a crochet pattern? No obligation you can say no if that’s not your cup of tea but I thought I would ask. I’m currently working on your slouch pattern using the #1 yarn. I used a #2 and a G hook and I’m just to the final brim section. I just wanted to let you know that I really enjoyed crocheting with the finer thread and smaller hook. It was absolutely relaxing. I couldn’t find a solid color for the brim so ended up buying enough extra yarn to make it all one multi=colored piece. I’ll send a photo when I’ve completed it. Thanks for your time and I appreciate you sharing your art. You obviously have a passion. Love this pattern. Made the boot cuffs, now working on the cowl. I love the simplicity of it but the elegant results 🙂 was wondering if you have a matching pattern for a hat? Congratulations on the birth of your new baby Henry James. Enjoy this special time. I saw this pattern on FB. Loved it and whipped my own cowl out that same day! Thank you for sharing. Congrats on #3. I love the name, my 5 grandchild was named Henry James, great choice!!!! P.s. I will be trying your cowl, just learning crochet. I am a knitter. 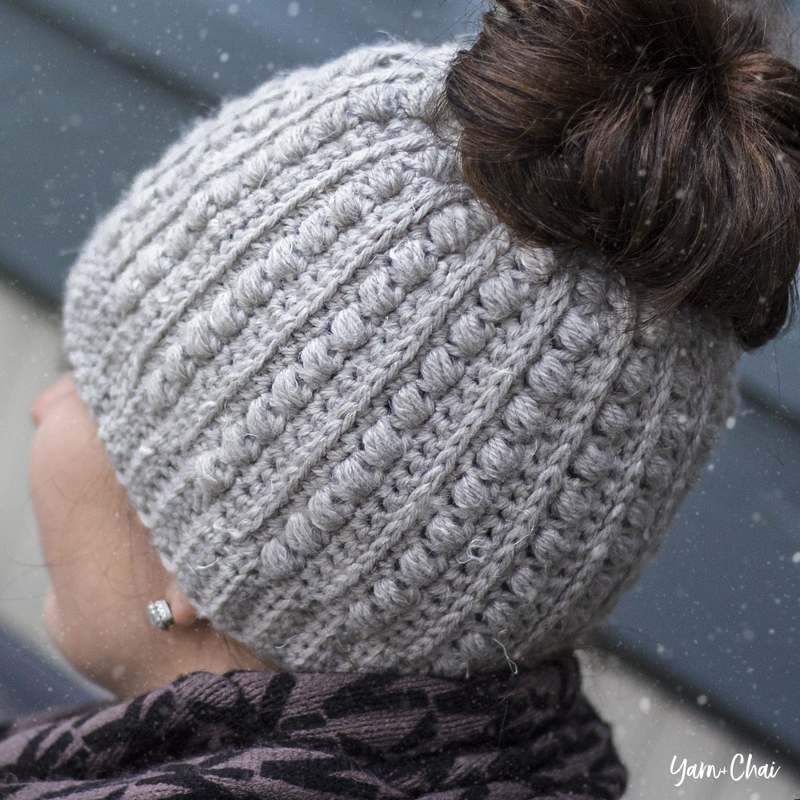 What a lovely pattern – the SC + HDC combo looks great! I have also made the comfy squares textured blanket which uses the same stitch combo. It also turned out wonderfully. Thank you so much for sharing. Do you happen to have a hat pattern using the same stitch as the textured cowl?